The Tropical Pharmacy articulates three works in a cohesive set that has been specifically conceived for its presentation at the Guggenheim Museum Bilbao. 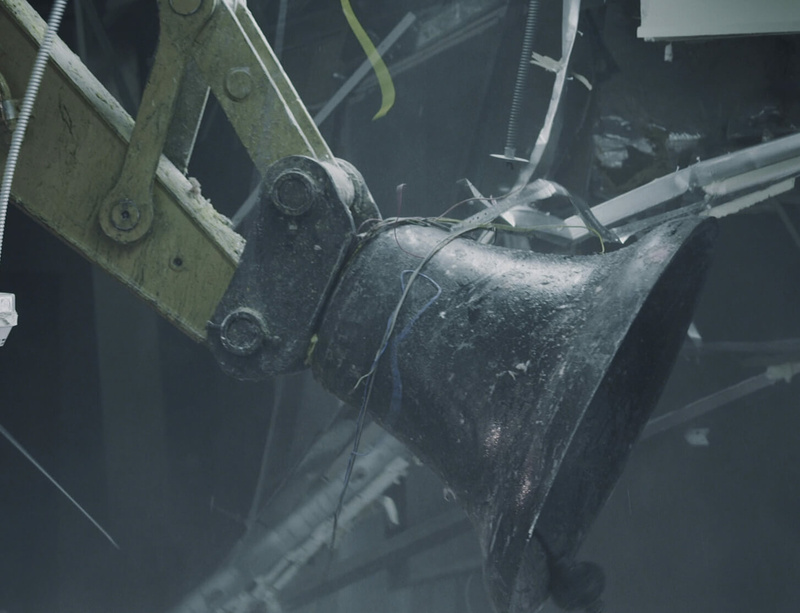 Providing the title to the exhibition, The Bell, the Digger, and the Tropical Pharmacy (2013) spectacularly documents the demolition of one of the largest US-owned pharmaceutical manufacturing plants in Puerto Rico, an event that is emblematic of the island’s highly asymmetrical political and economic framework of colonial exceptionality, defined by the reckless pace of capital flight in an “un-incorporated” territory and the low levels of corporate accountability in the exploitation of the region’s resources. While the idea of a “tropical pharmacy” evokes the great potential of the Caribbean-specific biodiversity for human use, the expression can but ironically recall Puerto Rico’s situation of abandonment and medical deprivation. The screening of this striking piece alternates with that of Sweat Glands, Sweat Lands (2006), a work made in collaboration with multi Grammy-awarded musician René Pérez Joglar, a.k.a. Residente Calle 13. Set in a semi-constructed roasting structure or lechonera, the scene presents a vehicle that has been hacked as a barbecuing device. A man inside it rotates a roast using the gas pedal while we hear Residente’s vocal performance of a poem, where descriptions of organic processes, prehistory, and capitalism chaotically intermingle with flashes of animal perception in a tropical ecosystem in crisis. The two alternating video projections are in continuous dialogue with Deadline (2007)—a film recording made on the wake of hurricane George in San Juan de Puerto Rico. The 16mm film captures a frond precariously dangling midair between two palm trees. Suspended from an unseen kite filament, the floating branch challenges gravity in its arrested fall, introducing an uncanny lapse in the devastation of the landscape.